If you know your Alice in Wonderland and Through the Looking Glass, you would be familiar with an un-Birthday. 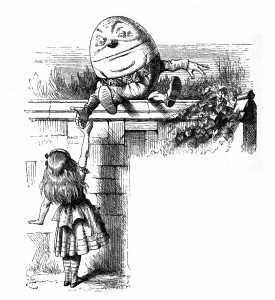 As explained by Humpty Dumpty: “There are three hundred and sixty-four days when you might get un-birthday presents… and only one for birthday presents, you know.” (Carroll, 2009). So, an extension of the concept is that any significant day could be celebrated any time – 364 days of the year (minus one of course, because that is the actual day). Personally, I think September is a better time to celebrate New Year’s Day. Specifically, the day following Labour Day. This year, September 6th. Why? Because everything is ahead, untouched. New classes, new deadlines, new friends to discover. All is possible, ready to be revealed, and free to the imagination. As well, it is really the only time that I find myself setting goals and resolutions. I am back planning now so I can be where I need to be by the end of May 2017. Summer is over, and the time has come to face new challenges. For students, the day following Labour Day is the real fresh start of a new year. The dog days of summer (a summer period marked by lethargy, inactivity, or indolence) are in the past, the seasons are changing, as are daily routines and schedules. So let’s get on with it! What goals and resolutions are you setting as we transition through the Un-New Year? HAPPY UN-NEW YEAR to all new and returning graduate students. Hope your summer was restful and invigorating. Now is the time to set some goals, and go for it. All the best in the new year. Cheers and good luck. Carroll, L., Haughton, H., & Carroll, L. (2009). Alice’s adventures in Wonderland ; and, Through the looking-glass and What Alice found there. New York: Penguin Classics. Previous Post What Made You Go To Grad School ?